Ensuring the safety of visitors is key to tourism in Pattaya and has become a primary focus of the Chon­buri Immigration Office, its superintendent said. Pol. 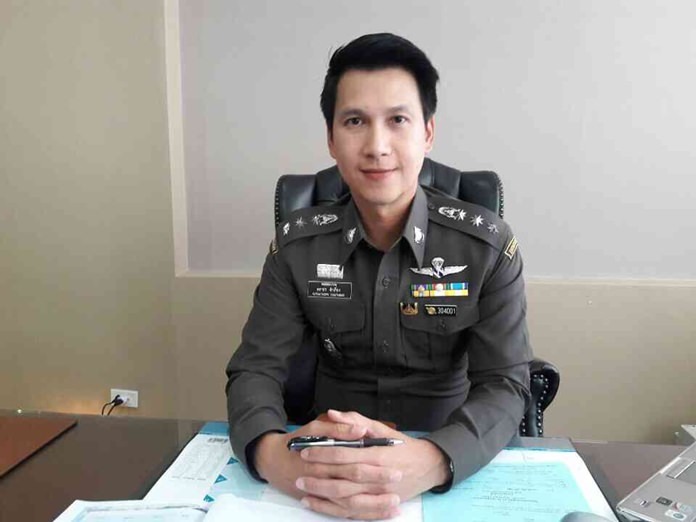 Col. Katatorn Khamtieng, Chonburi Immigration chief. Pol. Col. Katatorn Khamtieng, who took over the Jomtien Soi 5 office in May after a stint in Prachuap Khiri Khan, said in an interview that the office has pushed hard on hotels, construction companies and restaurants to report foreign guests and employees because it is an important security measure. It also goes hand-in-hand with the Immigration Division’s “good guys in, bad guys out” policy to weed out fugitives and undesirables while welcoming genuine tourists. “The number of foreign visitors is growing and is expected to continue to grow. New policies have been installed and many may see some changes made in the immigration office its services,” Katatorn said. Another of his priorities, he said, was to improve service and convenience for those seeking visas, doing 90-day reports and making other inquiries. Having already served as head of immigration for the Hua Hin area, Katatorn said he is using some lessons he learned there in his Pattaya-area position. However, this area poses more challenges as it has far more visitors, he said.